There are a number of presuppositions in NLP. 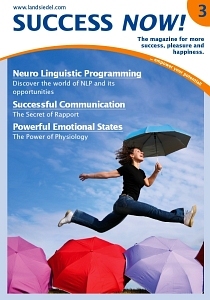 They represent important foundations for working with NLP. There are some presuppositions which are neither clearly true nor false. If we pretend they are true, they will help us to use NLP successfully. In mathematics we prefer to talk about axioms. In this field a common ground is also needed for meaningful work. We all have different conceptions of the world. None of them represents the world completely and accurately. People respond to their map of reality and not to reality itself. 2. Within their model of the world people always make the best choice available at any given time. You must have had times of severe stress when you did not behave the best way, because at that moment you just didn't see a better option. 3. Behind very problematic behaviour/symptom, however serious, there is a good intention. Every behaviour is trying to achieve something positive in that person's life, regardless of possible, negative side effects. An illness, for instance, can be interpreted as a positive message from the body. 4. For every behaviour there is a context in which it can be beneficial or useful. Once learnt, never forgotten, i.e. this behaviour has led to success at some time in the past. The aim is to develop more choices in addition to this behaviour. 5. People already have all the resources they need for every desired change. The aim of NLP is to activate our own resources at the right moment and to use them in an optimal way. 6. In communication there is no such thing as failure, only feedback. Every reaction and outcome can be used as feedback and an opportunity to learn. Seen as feedback, they provide important clues as to whether a certain solution is appropriate and if not they invite us to search for new ways. 7. The meaning of communication is the response you get. We communicate to receive a desired response. If you are not getting the result you want, your own message hasn't been received. Instead of reacting negatively it makes sense to change one's own behaviour. 8. If what you are doing isn't working, do something else. If we are flexible, we will regard every reaction as an outcome and thus as valuable information. 9. There are no resistant people/clients, only inflexible communicators/consultants. Resistance is not the unwillingness of others but a sign of a lack of rapport. When faced with resistance, what is needed may be a (new) effort at establishing a rapport rather than a stronger argument. 10. There are no right or wrong models of the world. Everyone sees the world differently. We perceive the world through our own channels of perception. As we do so, we filter out a great deal of information. From the remaining impressions, noises, pictures and smells we form our own map of the world. However, we often forget that this is only one interpretation and not the real world. Imagine you have caught a cold and need some medication from the pharmacy. You drive to the pharmacy and spot a parking space. You are just figuring out how to manoeuvre into the space when a red Porsche comes from behind. "He must be in a hurry," you think and pull over to let him pass. Yet it seems he wants to get to the pharmacy too, and before you know it he has taken your parking space. You drive to another parking space. When you get to the pharmacy the red Porsche has already gone. As you go in, the chemist says "Would you mind waiting a moment, please." What does that make you think about the driver of the red Porsche? Maybe you complain to the chemist that they were served really quickly while you have to wait. Now the chemist says: "His boy is having a severe fit and needs this drug urgently, every minute counts." How does that make you see the driver now?